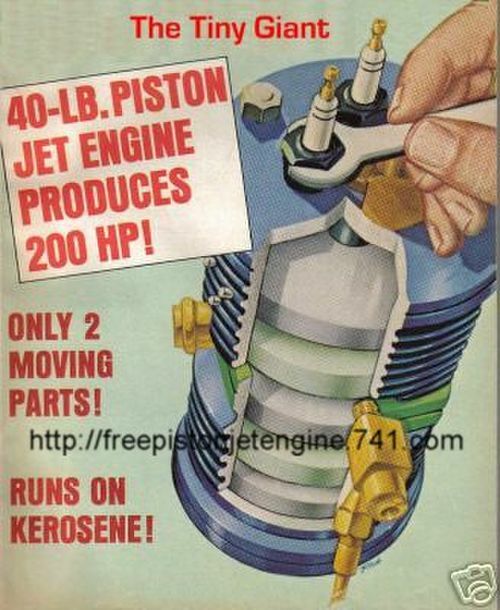 November 1948 Popular Science Free-Piston Power: Diesel's Newest Rival? Revolution of the free-piston engine. "In your present engine (4 cycle) there are masses of moving metal - - connecting rods, crankshaft wheel. The new engine (Free-Piston) eliminates these parts. Two piston slide freely in a horizontal cylinder." This engine requires no spark plug. It is quiet, vibration free, light. It is ideal for aircraft. "Further, the free-piston is by all odds the most efficient power plant ever developed -- an important point since the world stock pile of fuels is steadily dwindling"
This report goes on to give the history of the free- piston development. There were crude models built as long as 100 years ago. In the 1920's the Swedes invented an awkward model. The Germans used such an engine in their war-time submarines. The United States Navy began studying the concept in 1943. "Applications to automobiles appear to be well in the future, but such applications have dazzling appeal. A free-piston engine would be unbelievably quiet and vibrationless. It would be so small that it could be placed anywhere that it would give 50 to 60 miles per gallon of fuel - - - diesel oil or kerosene." The above report is not an isolated article. Books have been written on the free-piston engine. Its use in stationary power plants is widespread. Details of its production and how it works are found in Business Week, April 25, 1953, pages 101 - 106. Generating more power from less fuel -- free piston engine--production. New Engine - -free piston. "This engine has many qualities that may endear it to Detroit and the motoring public. Like the gas turbine engine, it will run on the lowest grades of fuel, will even run on peanut oil. It needs no crankshaft or connecting rods, and it has so few rotating parts that friction and wear are far less than in standard piston engines. Furthermore, unlike the gas turbine, its turbine wheel runs cool, hence does not require costly heat-resistant alloys." "The free piston engine is a hybrid: a simplified piston engine that develops no direct mechanical power, but delivers high pressure exhaust gas that can be made to run a turbine, just like steam from a boiler (see diagram). In each horizontal cylinder or "gasifier" (there may be any number of them feeding the same turbine) are two pistons that slide back and forth. When they move together in the center, they compress a charge of air and heat it so hot that fuel sprayed into it burns immediately, as it does in a conventional diesel engine. The explosion heats the air still hotter, raises the pressure and forces the pistons apart. As they move away from each other, they do three things: 1) the large disks on their outer end draw fresh air from the atmosphere into chambers behind them; 2) they compress captive air in a "bounce chamber" at each end of the cylinder; 3) they uncover two sets of ports in the wall of the combustion chamber. Compressed air previously stored in the compartment surrounding the combustion chamber rushes through the open ports, scavenging out of it the burned gases and pushing them, still at high pressure, into the pipe that leads to the turbine. At last the increasing pressure in the bounce chambers stops the pistons and pushes them back toward the middle of the combustion chamber. Their end disks act as air pumps, raising the pressure of the air in the storage compartment. When the pistons have covered the ports, the air in the combustion chamber is compressed and heated, and the cycle starts over again. The net result of this operation, which may be repeated thousands of times per minute, is a large volume of gas forced through the spinning turbine to create mechanical energy. " "For use in automobiles, trucks, etc. the free piston engine has special advantages. The gasifier, its heaviest part, can be placed under the hood while the turbine can be in the rear at the end of a gas pipe. 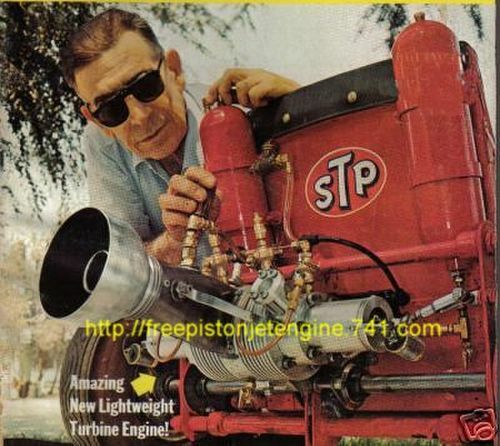 This eliminates the drive shaft that clutters low-slung cars, and it distributes the engine's weight in a desirable way. Unlike straight gas turbines, free piston engines have quick response. The man whose self-confidence is supported by making jackrabbit starts when the traffic light turns green will not suffer deflation if his dream-car of the future has free pistons in it." Free piston engine tried in a car! "Like true gas turbines, it isn't finicky about fuel - -experimental engines have run on such a off beat hydrocarbons as whale and peanut oil. One big advantage is the dilution of exhaust gases by compressed air, which means that turbine blades need not spin in destructive high temperatures." Free piston engine will power cars and plants. "The cycle occurs about 70,000 time per minute, moving the pistons about 2 inches, and expelling large amount of gases, at high pressures, through the exhaust ports which lead through a contoured tube. The gases are collected in this tube, or after-burner, and are pushed out at high speeds giving it a jet-like thrust. It is the number of moving parts in this engine that is so fascinating. In reality the only moving parts are the pistons connected by a rod. Mr Gahagen says some people may count the disc-like valves as moving parts, but these require no lubrication. With few parts, the lubrication is easy. Adding 3% oil to the standard gasolene gives all the necessary lubrication to the piston riding inside a 5 inch steel sleeve." "Due to high thrust the Piston Jet Engine can be used where turbo-jets aren't practical. To further increase this thrust and to increase the volume of gases, a metal plate, equally spaced between the walls of the nozzle, would be added. This plates cuts the nozzle into two halves. Water sprayed from a supply line to create steam would increase the thrust of the engine significantly." "The efficiency of the Free Piston Jet has been calculated an astounding 50%. The Otto four-cycle engine has a thermal efficiency of only 30%, the Diesel Engine a good 40 %. Their respective Compression rates are 6:1, Otto; 16:1, Diesel; and nearly 25:1 for the Piston Jet Engine"
Featuring 'The Loudmouth' on the cover. According to Jack Horton the Loudmouth was a turbine because it met the requirement of reacting to a current of fluid, which is subjected to pressure-in this case, high temperature, high pressure, high velocity gases. A turbine blade or impeller does not necessarily have to be metallic. It could be steel, wood, or plastic. In the case of this free piston engine, the spinning impeller is gaseous, when the powerful gas exhaust reaches the special nozzle, it creates a vortex causing its gases to spin at high speed, which is similar to a modern turbine impeller. Its high powered thrust is achieved because of the vortex phenomenon of spinning gases. More details and graphics on the way, check back often.